Take away the snakes and the sunburn, and Watamu, Kenya truly does look like paradise. Endless white sand cozies up to a sparkling blue ocean, surrounded by lush greenery and sprinkled with towering coconut palms. Nothing could be more different from my drafty home in cold, rainy Amsterdam. What business do I and the rest of HAI’s Snakebite Team have here in this postcard Kenyan city? 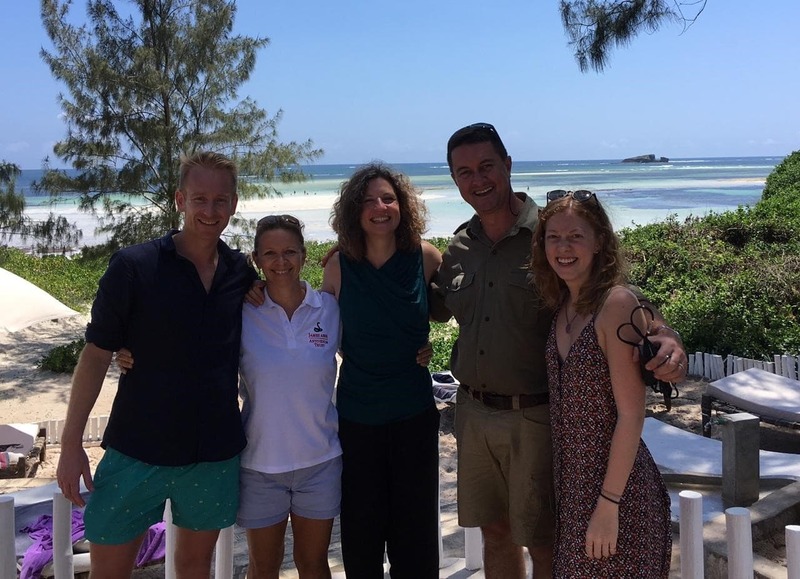 HAI’s Snakebite Team and in-country partners meet near Kenya’s picturesque coast. Left to right: Benjamin Waldmann, Clare Taylor, Sophie von Bernus, Royjan Taylor, Sabrina Hennecke. HAI’s in-country partners, Royjan and Clare Taylor at the Bio-Ken Snake Farm and James Ashe Antivenom Trust, have chosen this picturesque landscape to call home because this is a place where the crisis of snakebite is well understood and experienced daily. This paradise harbours countless venomous snakes. HAI’s Snakebite Team went to join in the development of an internationally-coordinated response to the global burden of snakebite envenoming. Royjan Taylor, Director of Bio-Ken Snake Farm and Trustee of the James Ashe Antivenom Trust, welcomes guests to the Bio-Ken seminar. Every two years, Bio-Ken puts on a seminar on herpetology and snakebite, but this year was different. This time, the seminar was designed to move from talk to action. We weren’t an audience of listeners, but an audience of actors. By invitation only, they’d drawn an international audience of key stakeholders from Australia to South Africa. Government, research, medicine, and snake handlers were all represented, and the media was abuzz with curiosity. Then, in a moment that served as a catalyst for the following two days, she pulled out a small white piece of paper. A cheque. Dr Omar presented the cheque to Royjan, a trustee of the James Ashe Antivenom Trust, who promised that this gesture of government-backed local support will go directly towards buying safe and effective antivenom. The Right Honourable Dr Anisa Omar, Head of Health Services at the Kilifi County Government, presents cheque to the James Ashe Antivenom Trust for safe and effective antivenom. Following a screening of the documentary, Minutes to Die, and several presentations, the room was still packed and the audience as attentive as a cobra within a snake handler’s reach. With presentations from the World Health Organization, physicians, snake experts, civil society and more, there was so much to learn. Our team presented HAI’s sub-Saharan snakebite research findings—findings that had shown Dr Omar evidence of the extent of their snakebite problem in Kilifi County, and the need for action—as well as solutions that we’re acting on, including mobilising our multi-stakeholder platform (which, in Kenya, is called Snakebite Kenya) to affect real policy change in the country. We were also interviewed by the national TV station, Citizen TV. 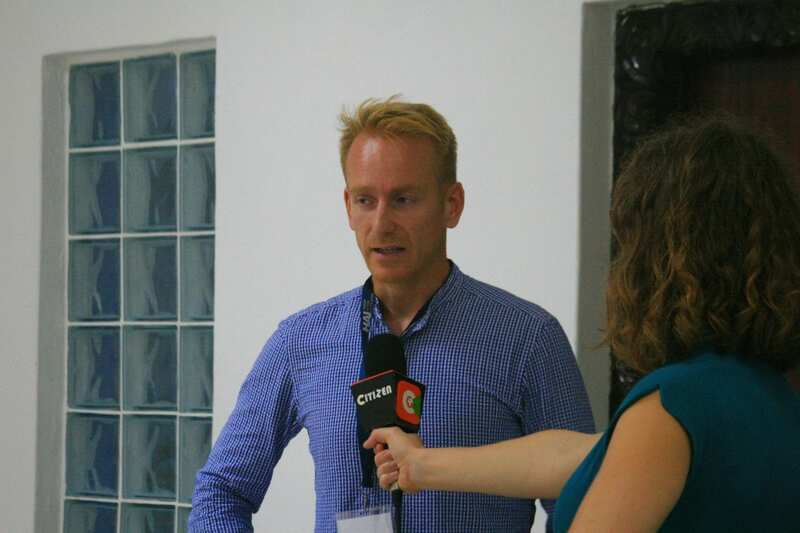 Ben Waldmann, HAI’s Snakebite Programme Manager, is interviewed by Citizen TV during the Bio-Ken Seminar on Snakebite in Watamu, Kenya. The questions poured in, and by the end of day two, all attendees were fundamentally on the same page on key issues. The burden of snakebite envenoming is huge, and vastly neglected. Doctors need better education and tools for snakebite management and are eager to learn. Communities need education on snakebite first aid, prevention and where to go and what to do when bitten. Snakes can be dangerous, but are essential to the ecosystem and need protecting. Perhaps most importantly, the antivenoms most commonly used in sub-Saharan Africa are not working, and known effective antivenom needs to be registered and made available. 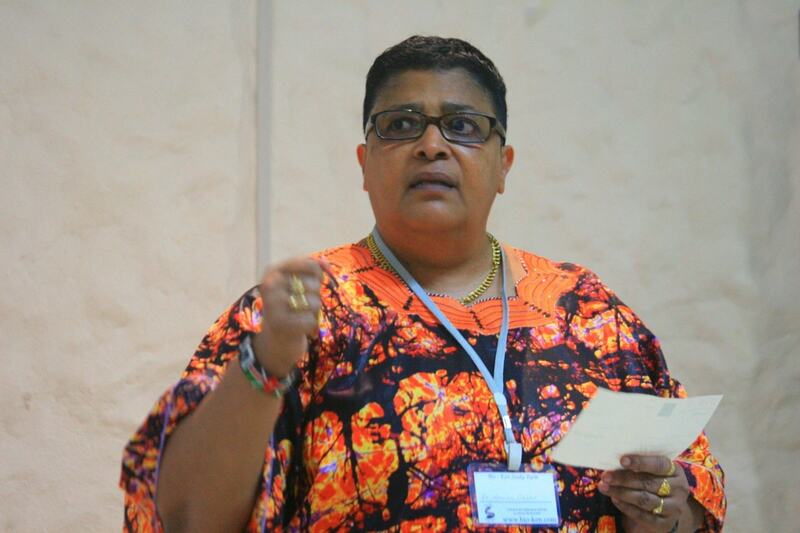 A member of the Kenyan Pharmacy and Poisons Board stayed through all two days. He showed a clear willingness to work together with stakeholders to solve these issues raised about the current lack of effective, safe and accessible antivenom. 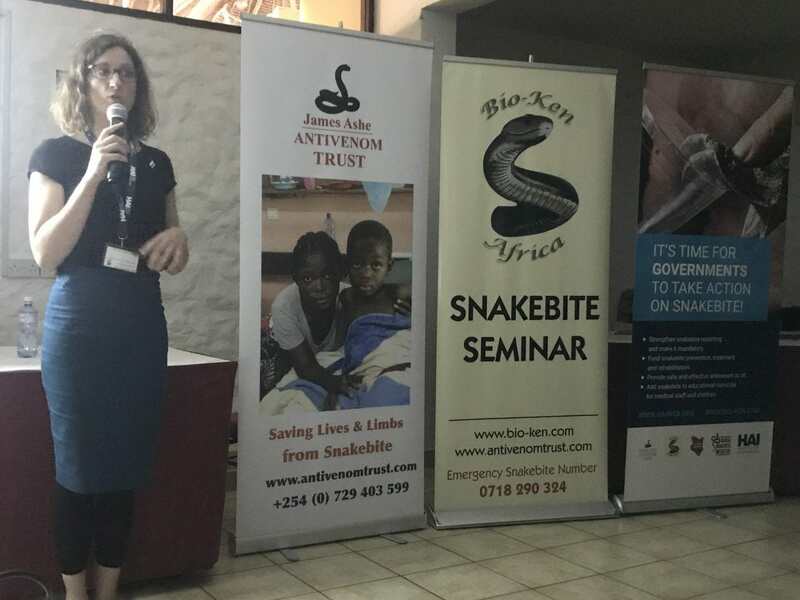 Sophie von Bernus, HAI’s Snakebite Programme Officer, presents findings from our research on snakebite incidents, responses, and antivenom supply at the Bio-Ken seminar on snakebite. The seminar was a smashing success. Bio-Ken raised enough money to buy 40 vials of effective antivenom—enough to save about eight lives. Sure, we’ve got a lot of work ahead of us, but the solutions are clear. It’s just a matter of getting the right people and resources on board, and this seminar offered us a big step in the right direction. We don’t want to save eight lives; we want to save ALL lives from snakebite death and disability. Ben, Sophie and I—HAI’s Snakebite Team—traveled home on that last night in a tuktuk. 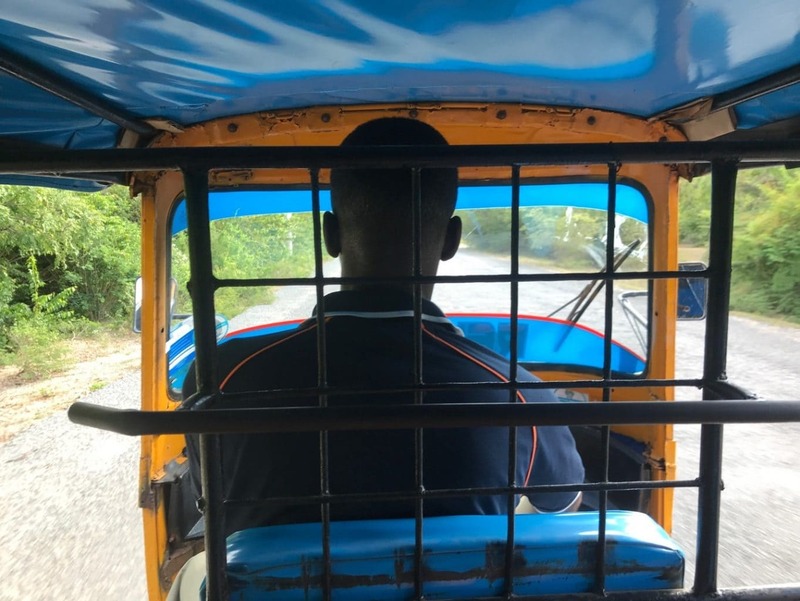 Squished into the back of this three-wheeled vehicle, we bounced up and down, not only from the bumps in the road, but from excitement for the future. Tuk Tuk drive following the Bio-Ken seminar. Building an evidence base on snakebite incidents and responses, as well as access to antivenom, by surveying healthcare facilities and communities. changes by national stakeholders, including health ministries. 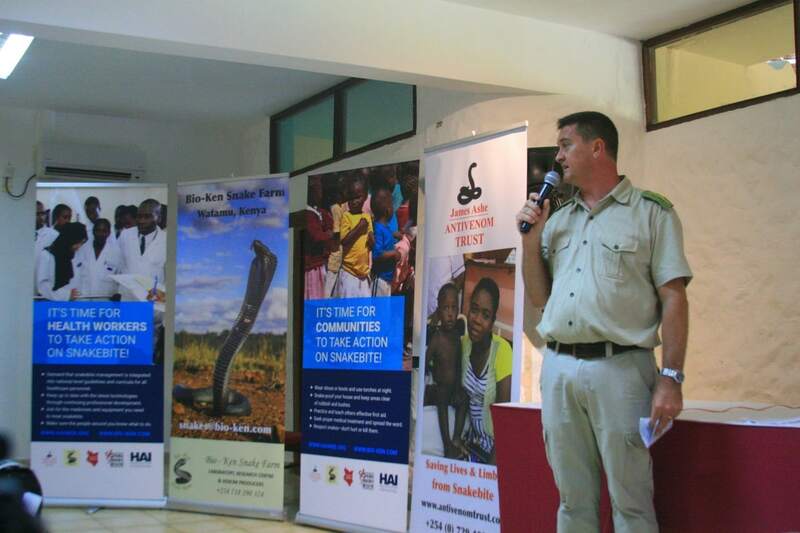 Providing communities with information and tools to learn how to prevent snakebite and provide effective first-aid and treatment for it. For more information on our programme, visit our Snakebite Programme pages at haiweb.org/what-we-do/snakebite-envenoming.